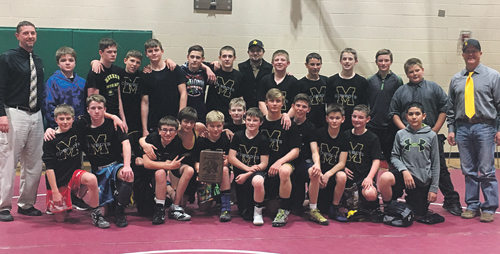 MEEKER | Sixteen varsity Barone Middle School wrestlers won four dual meets Saturday to win the team title for the Gypsum Creek Dual tournament. Five JV BMS wrestlers got matches by wrestling on other teams and all BMS varsity and JV wrestlers won at least one match. The young Cowboys will wrestle another dual today in Craig at 5 p.m., then wrestle in a bracketed tournament Saturday in Oak Creek. Meeker beat Eagle Valley 77-15, then Summit 67-22 before wrestling and beating Fruita 54-38 in the semifinals and Gypsum Creek 64-37 in the championship dual. Trae Kennedy (80), Porter Hossack (120), Tyson Portwood (130), Kelton Turner (140), Tanner Musser (165) and Parker Pontine (185) all won four matches, as did Connor Blunt, who also lost one at 115. Rowdy Rosendahl (85), Ty Goedert (90), Kaleb Nielson (95), Kaden Franklin (100) Zagar Brown (125), Dalton Portwood (135) and Zach Eskelson (155) all won three matches. Damon Dade (110) won two matches and varsity wrestler Robert Foster won one at 105. Liam Deming (115) and Dagan Dade (20) both won three matches, while Ivan Carrillo (115) won two and Damick Chintala gave up 10 pounds to wrestle and still won two matches. “We have some things to work on but we can see major improvement from week to week,” Morris said.